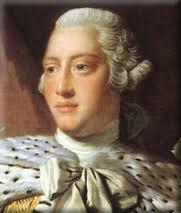 George III (1738-1820) was British king from 1760 until his death, a reign that spanned almost six decades. He was born in London on June 4th 1738, son of Frederick, Prince of Wales and Princess Augusta. 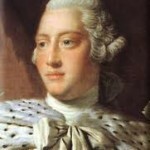 He became heir to the throne in 1751 and king in 1760, after the death of his grandfather George II. The young George III was the first of the Hanover kings to be fully British: the first born in England, the first raised in the Anglican faith, the first to learn English as his native tongue. He was intelligent and curious, qualities furthered by his Enlightenment-based education in the arts and sciences. Later in his reign, the king would show interest in new industrial and agricultural methods, earning the epithet ‘Farmer George’. But the king’s progressive streak did not extend to politics, where he was staunchly conservative. George III was enormously proud of the empire he ruled; he once claimed to “Glory in the name of Britain”. He has often footed the blame for the American Revolution and has frequently been described as the ‘king who lost America’. In reality, George III was only indirectly responsible for the revolution. He was a constitutional monarch who almost always accepted and endorsed the policies of his appointed ministers. He did not create the policies that fuelled revolutionary sentiments and action in America, such as the Stamp Act, the Townshend revenue duties, the Tea Act and the Coercive Acts. The king gave them his assent and possibly his endorsement. His personal writings and pronouncements reveal a king who was opposed to American independence to the very last. The loss of the North American colonies deeply affected George III, to the extent that he contemplated abdication. He came to accept the newly independent United States and the restoration of Anglo-American relations.